GSMArena team, 30 March 2015. 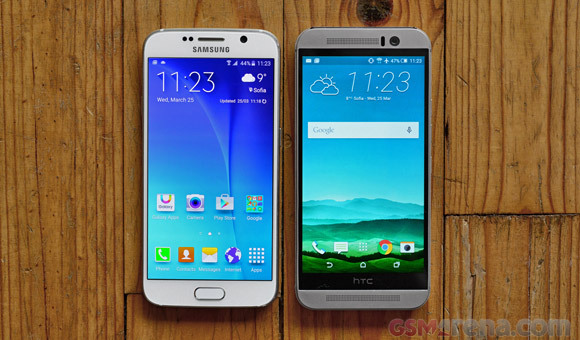 The last two generations of HTC One and Samsung Galaxy S were separated by the looks versus practicality debate. Samsung's revamped design erodes this difference, while HTC stepped up its camera game. HTC once ruled the Android world, but has since been supplanted by Samsung. Still, last year the companies' trajectories were reversing once again - Samsung's streak of record profits ended, as did HTC's streak of quarters in the red. This lit a fire under Samsung to change the foundations of its design. The new slender body of metal and glass is a big step forward from the Galaxy S5. It wasn't a sudden reboot though, Samsung iterated the design first with the Galaxy Alpha then with the Galaxy Note 4 to make sure the Galaxy S6 comes out great. Now HTC is the one stuck in a design rut, the HTC One M9 is a second rehash of the original HTC One design. Some (HTC designers and fans alike) will claim you can't improve on perfection. Looks aside, the One M9 misses out on some trendy hardware as well - QHD screen, fingerprint reader, wireless charging. HTC did make the jump to 2160p video capture and even overtook Samsung in still resolution with a 20.7MP sensor. We'll have to see if that's enough. To warm things up here's the blow-by-blow of the "specs on paper" round. Samsung will not have any issues in presenting the Galaxy S6 as a brand new, much improved device. The design is new, the screen is QHD, the camera has optical image stabilization, the fingerprint scanner is an improved design and so on. That said, it's making a bet that the majority of consumers don't care about expandable storage and removable batteries. HTC ad star Robert Downey Jr. will have more explaining to do. The design is the same, the screen is the same, there's no fingerprint scanner, the stereo loudspeakers are an old perk and so on. The PR team can crow about the high-resolution camera with 2160p video. The old UltraPixel isn't dead, it's now serving selfie duties - great for low-light shots from a night out. Of course, both phones are built around new and powerful chipsets. Samsung went its own way to leverage its manufacturing advantage - while the basic design isn't too different, the 14nm process keeps the chipset running cool. Snapdragon 810 on the other hand has had difficulties keeping cool, which reduces its performance potential. With all that HTC can still claim to have the more premium design and the better loudspeakers, while Samsung will point to the thinner, lighter chassis and sharper screen. Consider this a preview of what's on the next page, the hardware comparison. Update, April 3: we wrote this article using a pre-release Galaxy S6, but we received a retail unit and re-ran all the tests. The pages have been updated to reflect that - battery life and benchmarks improved, while the camera, display, audio quality and loudspeaker are essentially the same as before.